Have you ever seen an exciting new business and wonder “How did they think of that”? Many people dream about having their own business and some make it happen. One thing for sure, dreaming is a start, but until action is taken, it’s only a dream. Thymbol started as an idea by a true visionary. The founder of Thymbol was marketing for medical professionals and kept meeting struggling business owners and thought, “how can I help businesses succeed”. The Founder started talking to business owners to find out their needs and obstacles. He then shared his idea with a couple key people and Thymbol was born. So what is Thymbol? 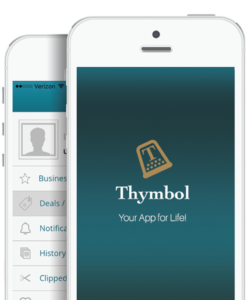 Thymbol is an affordable App based mobile marketing platform for businesses to help drive new and repeat customer to their doors with great deals. On Thymbol, each business has a branding page which includes their logo and video introduction, digital coupons that are created in real-time and a Facebook share feature, starting as low as $100 a month. Thymbol strives to create consumer confidence and offers a platform that consumers can rely on for accurate and updated deals and discounts. The App is free to download, no credit card information is required, and coupons are redeemed at the time of purchase. Geo fencing shows the businesses that are close to consumers. Consumers can share their coupons on Facebook with their friends, and “Favorite” a business to see new deals once it publishes in real-time.